This topic contains 10 replies, has 4 voices, and was last updated by Drew Morgan Apr 18, 2017 at 10:18 am. This is also my first post…nice to meet everyone. I float the Tallapoosa River in Alabama for warm water species and use an inflatable NRS Otter with the front and back seat fishing frame. It drafts an inch of water and is a super stable fishing platform for fly casting. Also the thing is virtually indestructible…a must have if you are fishing a river with a lot of exposed rocks and boulders like my home water. I also drive a 4 Runner…and it is too big/heavy to load on top so I use a trailer. It is light enough to carry to and from river access as long as you have a somewhat gradual bank. It is also too wide to fit into a truck bed. Hey Drew, the Tallapoosa isn’t that far from us here in Atlanta. What sections are you able to get that raft into? Would a hard boat be able to get down the river? Tim, sorry I’m just seeing this post. Logistics in remote areas are always a problem. With Uber, sometimes you have a surprising option to just call a cab as it were, and it’s worth checking that. Uber drivers will usually work with you to arrange pickups in advance. The classic Western style shuttle is to hire a guy you trust to move your rig down to the take-out while you float. The classic thing to do is leave your keys inside the gas hatch. Depending on where you are floating that may or may not be an option. In areas with lots of shuttles that’s usually only a $25 deal because there is competition. In places with fewer shuttles it might be $50. Your shuttle driver has to split the money because he has to have someone come pick him up at the takeout too so keep that in mind. Another option is the classic double vehicle drop. You drive to the takeout first, leave a car, then bring the second angler along with you to the put-in. Float back to the car you left and reverse the process. This is time consuming but free and often your only choice out in the sticks. Boat-wise, it sounds to me like you need a canoe at least to start with. You can get one off Craig’s List for $300 or so and that will give you a lot more info on what the float is going to look like so you can decide whether to bring a bigger boat. Zach, yeah it’s not too far. There are a lot of great stretches of the middle and upper Tallapoosa…but I mainly fish from Horseshoe Bend Park to essentially Lake Martin…there is a boat ramp right where the river empties into the lake. This is a 6 mile stretch and both put in and take out are excellent. 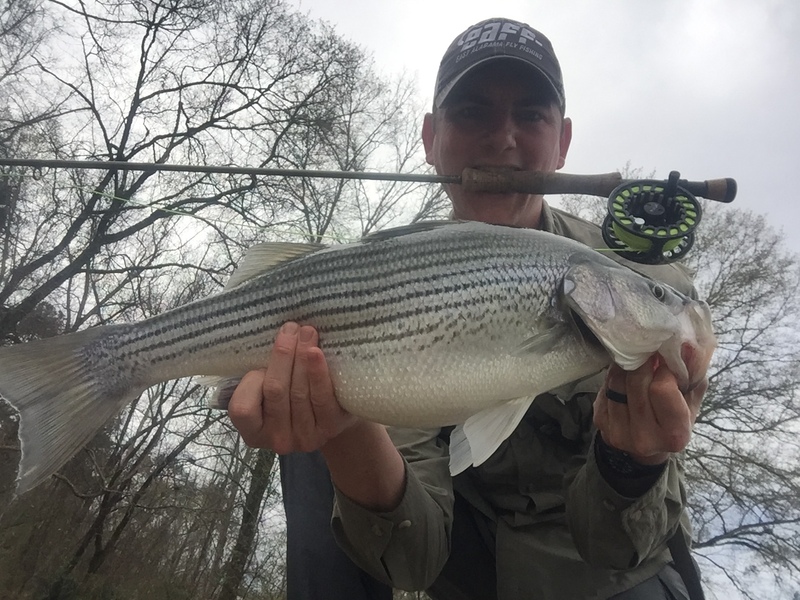 This time of year the striper move out of Martin and into the shallower shoals and channels of current. In the summer it is an excellent topwater spot (alabama bass) and redeye fishery. Drew what kinds of numbers of fish are you averaging in a day? 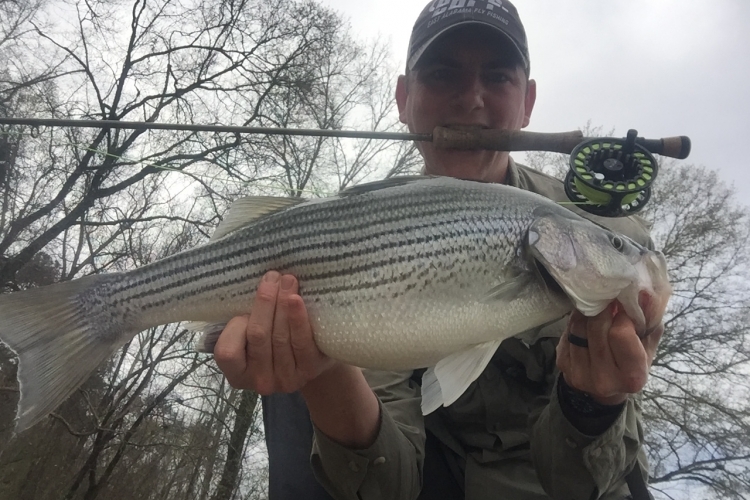 Zach, the striper fishery is more of a quality over quantity bite…although if you can get out there on a cloudy day at the peak of the run it can be insane. 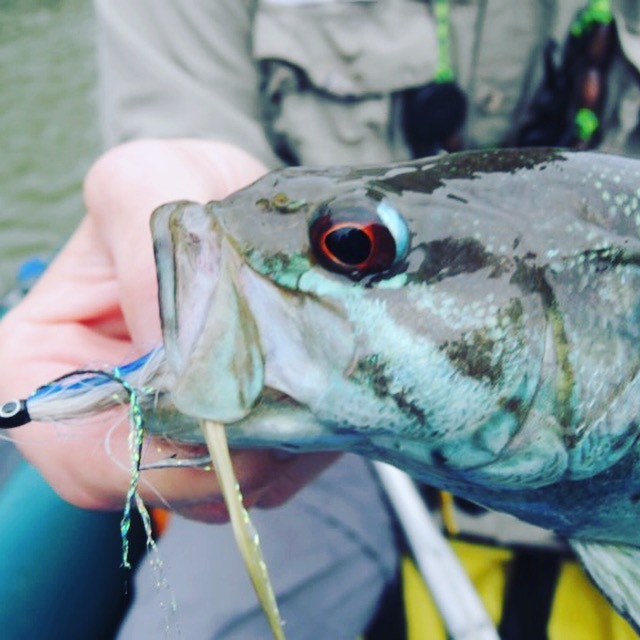 One day recently 8 out of ten casts took fish swinging shad imitations through current. 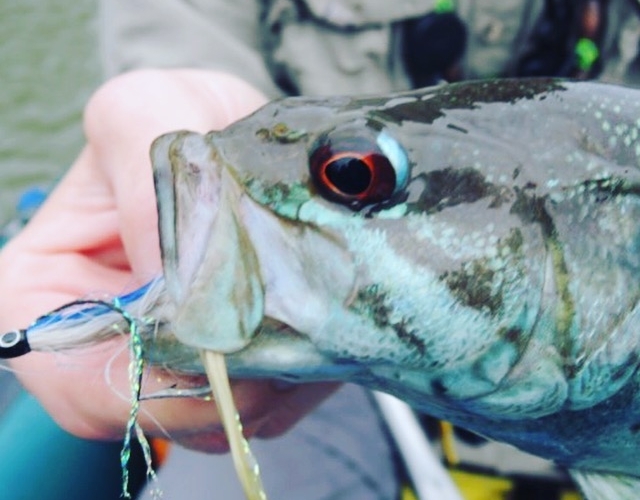 The spot and redeye bass fishery in the Spring and summer usually sees 10-20 fish to hand in a day. Of course you have a lot of bluegill and redbreasts mixed in. On days with really good bites it’s easy to go over 20 fish. 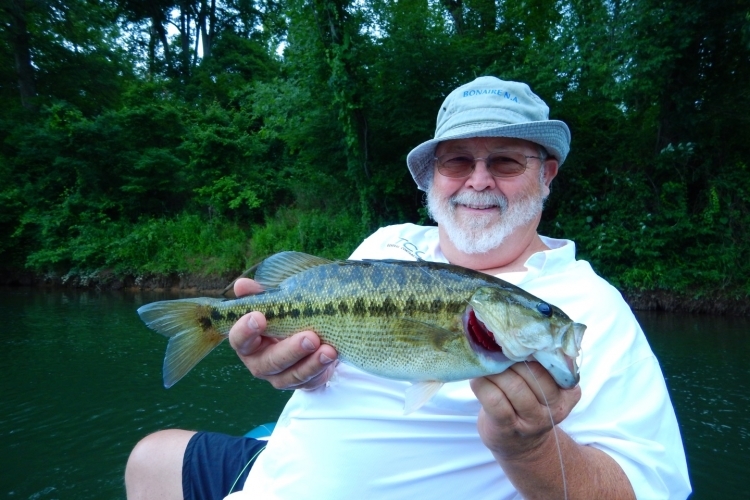 The fish on the Tallapoosa don’t get as big as other fisheries…a 3 pound spot is a trophy…but they are extremely aggressive and fun to catch on a 3 or 5 wt. The water is pretty clear and clean for a southern warm water river which means most of the time you can see the take. Thanks Drew, good info and nice pics. Drew I have fished Hillabee Creek some. How long does it take to float/fish that piece of the Tallapoosa River? Where do you take out? I saw one of the inflatable NRS drift boats this weekend and was very impressed. Looked like it would float high and eat rocks for dinner. Note the handles! This boat weighs 110lbs so it can actually be portaged, which is amazing for a hard boat. Yeah that Stealthcraft boat is sweet. I really like a lot of stuff they are doing right now. Their inflatables are also very light and able to portage.